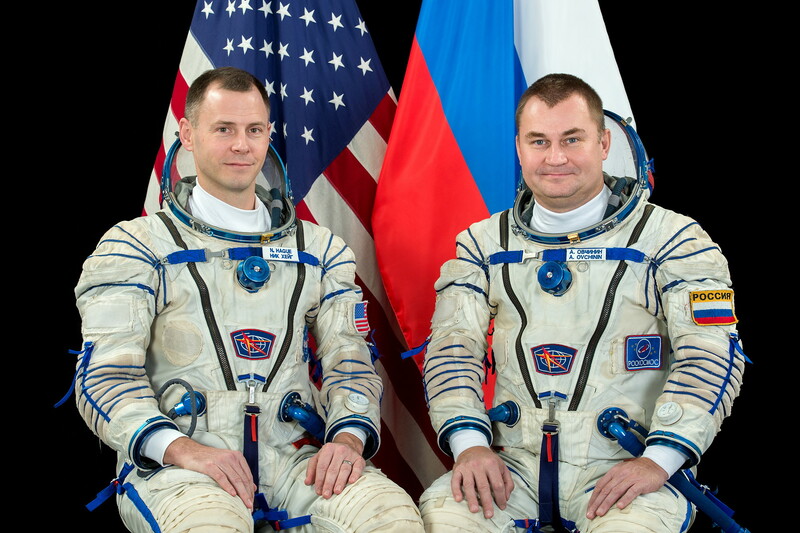 Given names: Tyler Nicklaus "Nick" Aleksei Nikolaevich Oleg Dmitriyevich David Anne Charlotte "Annimal"
ISS Expedition 56 began with the undocking of spacecraft Soyuz MS-07 on June 03, 2018 at 09:16:36 UTC. 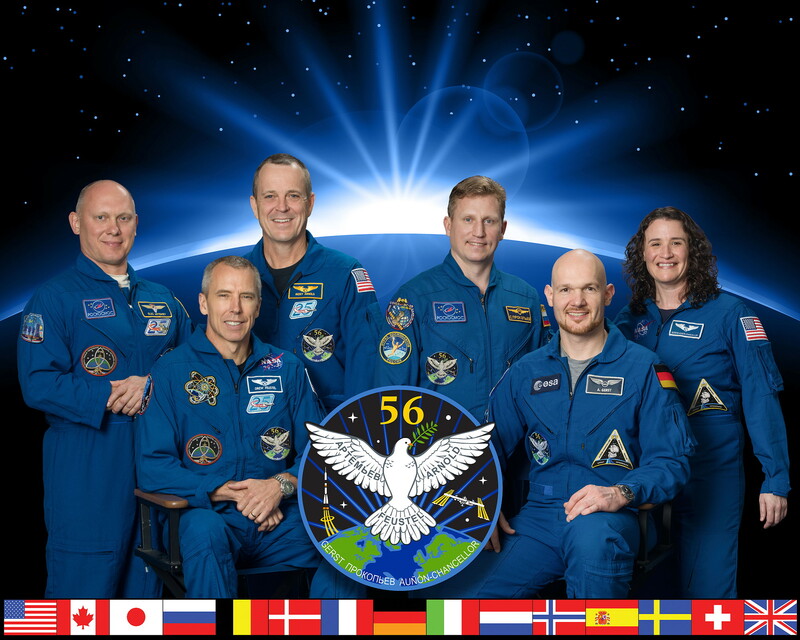 The former Expedition 55 (Anton Shkaplerov, Scott Tingle and Norishige Kanai) returned safely to Earth. Following a two-days solo flight Soyuz MS-09 docked to ISS on June 08, 2018. 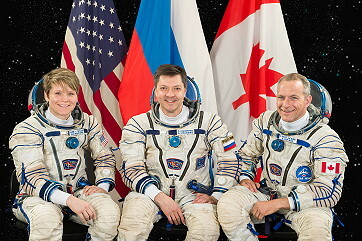 Sergei Prokopyev, Alexander Gerst and Serena Auñón-Chancellor became the ISS Expedition 56 (together with ISS Expedition 55 crew members Oleg Artemyev, Andrew Feustel and Richard Arnold). 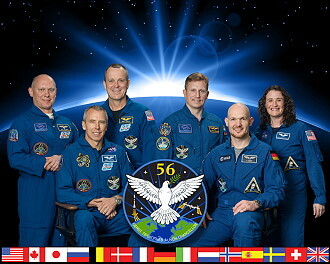 With the arrival Expedition 56 became a six-person-crew. Andrew Feustel and Richard Arnold performed the first spacewalk in Expedition 56 on June 14, 2018 (6h 49m). 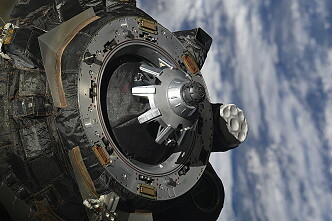 They installed a pair of brackets and high-definition cameras on the Harmony module that will help commercial crew vehicles align with the international docking adapter (IDA) at the forward end of Harmony. 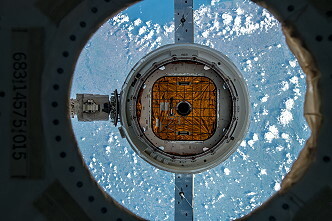 The cameras also will provide wireless data network access for experiments and facilities mounted on the ESA (European Space Agency) Columbus laboratory and Japan Aerospace Exploration Agency Kibo laboratory. 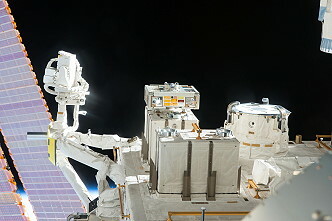 The crew also replaced a camera on the station's starboard truss. On June 23, 2018, an ISS reboost was performed using Progress MS-08 thrusters. This reboost was to set up for Progress MS-09 launch planned on July 19, 2018. The engines started at 08:15 UTC and fired 208 seconds. 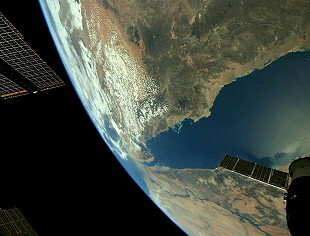 The ISS got 0.42 m / sec. more speed. The actual parameters are 403.7 km x 421.2 km. The ISS needs 92.60 minutes for each orbit. - A cellular biology investigation to understand how microgravity affects the growth, gene expression and ability of a model bacterium to transfer electrons through its cell membrane along bacterial nanowires it produces. Such bacteria could be used in microbial fuel cells to make electricity from waste organic material. 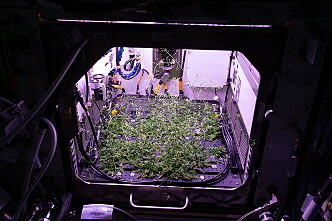 - An Earth science instrument called ECOsystem Spaceborne Thermal Radiometer Experiment on Space Station (ECOSTRESS) will provide a new space-based measurement of how plants respond to changes in water availability. This data can help society better manage agricultural water use. - Included in the cargo is a physical sciences investigation that will enable U.S. National Laboratory research, which is managed by the Center for the Advancement of Science in Space. The goal of this investigation is to improve our fundamental understanding of physical interactions between soil and sediment particles of quartz and clay, commonly found in a wide variety of environmental settings such as rivers, lakes, and oceans, which has important applications on Earth for geologists and engineers. Additional biology and biotechnology investigations seek to improve understanding of endothelial cells that line the walls of blood vessels, the location of the hydrogen atoms in a molecule as a means to target drug design and delivery, and the genes in algae that cause growth. - An observational pilot study with the Crew Interactive MObile companioN (CIMON) aims to provide first insights into the effects of crew support from an artificial intelligence (AI) in terms of efficiency and acceptance during long-term missions in space. Among the hundreds of pounds of hardware flying to the space station is a spare Canadian-built Latching End Effector (LEE). Each end of the Canadarm2 robotic arm has an identical LEE, and they are used as the "hands" that grapple payloads and visiting cargo spaceships. They also enable Canadarm2 to "walk" to different locations on the orbiting outpost. About 10 minutes after launch, Dragon reached its preliminary orbit and deployed its solar arrays. A carefully choreographed series of thruster firings are scheduled to bring the spacecraft to rendezvous with the space station. On July 02, 2018 Andrew Feustel and Richard Arnold captured Dragon using the space station's robotic arm (10:54 UTC). 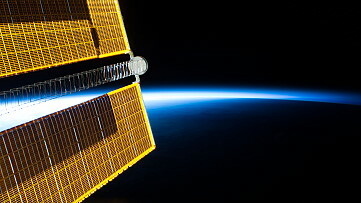 Ground controllers then sent commands to robotically install the spacecraft on the station's Harmony module (13:52 UTC). The launch of the unpiloted Russian Progress MS-09 occurred on July 09, 2018 at 21:51:34.452 UTC from the Baikonur Cosmodrome in Kazakhstan. 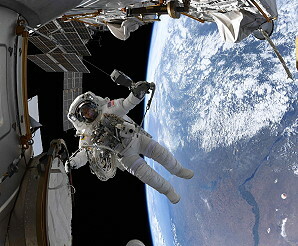 The freighter delivers 2,567 kg of food, fuel and supplies to the International Space Station (1,565 kg of "dry cargo", 530 kg of propellant in the refueling system tanks, 420 kg of water in Rodnik systems tanks, as well as 52 kg of bottled compressed oxygen, scientific equipment and components for the life support system, as well as containers with food, clothing, medical supplies and personal hygiene items for the crewmembers are stowed in the cargo compartment. Onboard is the new EVA Spacesuit Orlan MKS No.5. 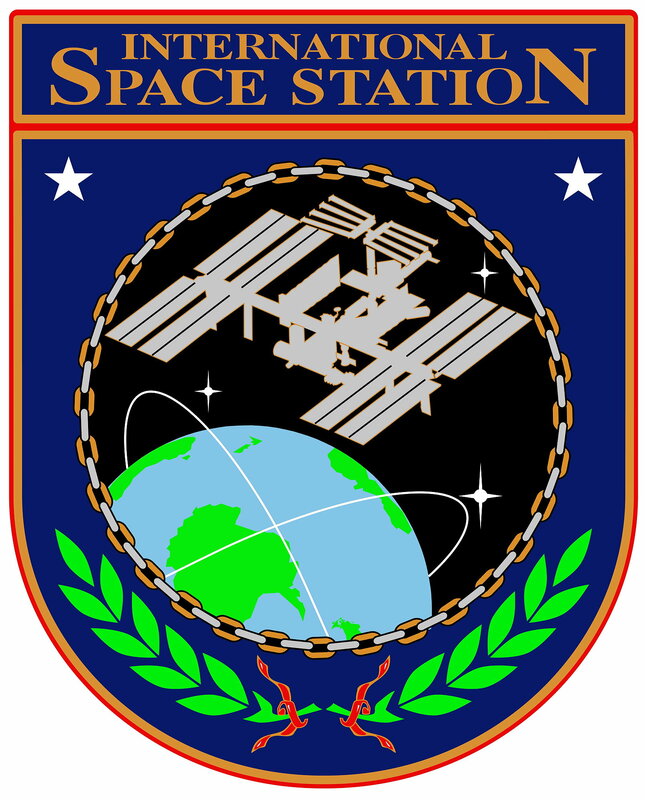 The spacecraft docked only three hours later to the Pirs module of the space station on July 10, 2018 at 01:30:46 UTC. 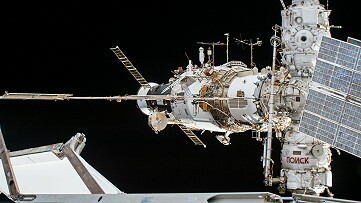 This was the fastest docking after the lauch of a spacecraft. Progress MS-09 will spend almost six months docked at the station before departing in late January 2019 for its deorbit into the Earth's atmosphere. On July 10, 2018, an ISS reboost was performed using Cygnus OA-9 (now Cygnus NG-9) thrusters. It was the first commercial freighter used for a reboost. This reboost was was a test for upcoming reboosts. The engines started at 21:24:50 UTC and fired 50 seconds. The ISS got 0.05 m / sec. more speed. 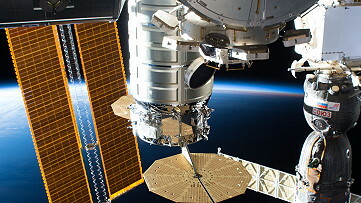 Nearly two months after Orbital ATK, now part of Northrop Grumman, delivered several tons of supplies and scientific experiments to the International Space Station aboard its Cygnus cargo spacecraft, the spacecraft left the orbiting laboratory on July 15, 2018 at 12:37 UTC. 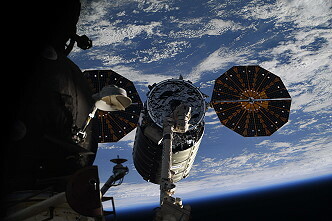 Alexander Gerst and Serena Auñón-Chancellor used the station's Canadarm2 robotic arm to release Cygnus, dubbed the SS "J.R. Thompson", after a leader in the aerospace industry. 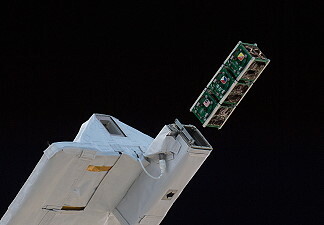 Following its release, Cygnus deployed a series of NanoRacks customer CubeSats. 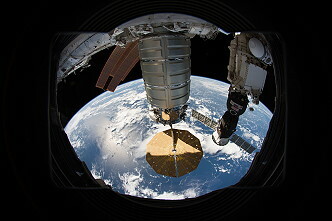 The cargo craft then remained in orbit for an additional two weeks to allow the Cygnus flight control team to conduct engineering tests. Cygnus is scheduled to deorbit with thousands of pounds of trash on July 30. 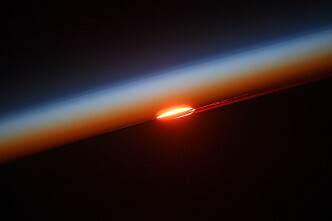 2018, as it burns up harmlessly over the Pacific Ocean while entering Earth's atmosphere. Cygnus launched May 21, 2018 on an Antares rocket from NASA's Wallops Flight Facility in Virginia and arrived at the station on May 24, 2018, carrying a variety of science and technology investigations. On July 26, 2018, an ISS reboost was performed using Progress MS-08 thrusters. This reboost was to set up for Soyuz MS-08 landing on October 04, 2018 and Soyuz MS-10 launch planned on October 11, 2018. 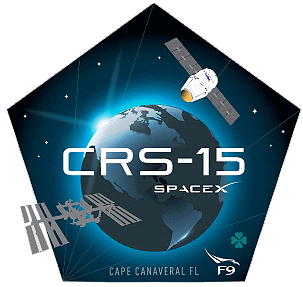 The engines started at 16:10 UTC and fired 199.2 seconds. The ISS got 0.4 m / sec. more speed. The actual parameters are 402.5 km x 423.0 km. The ISS needs 92.60 minutes for each orbit. After delivering more than 5,800 pounds (2,630 kg) of cargo, a SpaceX Dragon (CRS-15 or SpX-15) cargo spacecraft departed the International Space Station on August 03, 2018. Flight controllers used the space station's Canadarm2 robotic arm to detach Dragon, which arrived on July 02, 2018, from the Earth-facing side of the station's Harmony module. 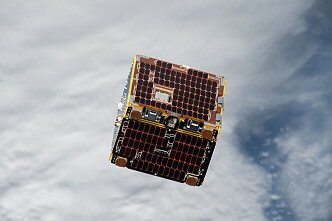 After Dragon was maneuvered into place, the spacecraft was released by a ground-controlled command monitored by Serena Auñón-Chancellor at 16:38 UTC. 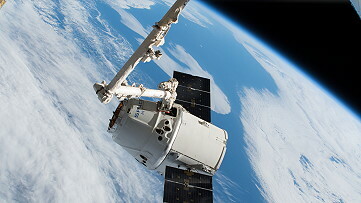 Dragon's thrusters were fired to move the spacecraft a safe distance from the station before SpaceX flight controllers in Hawthorne, California, commanded its deorbit burn. The spacecraft splashed down at about 22:17 UTC in the Pacific Ocean, where recovery forces retrieved Dragon and more than 4,000 pounds (1,814 kg) of cargo. 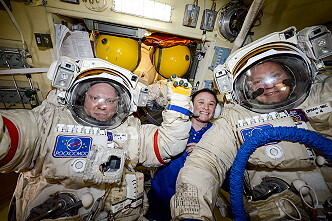 On August 15, 2018 Russian cosmonauts Oleg Artemyev and Sergei Prokopyev left the International Space Station for a second spacewalk (7h 46m). 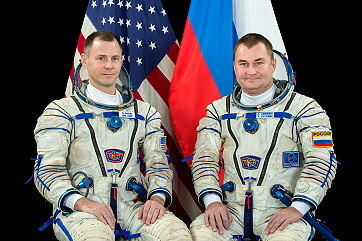 The duo released four tiny satellites into Earth orbit, installed antennas and cables on the Zvezda service module and retrieved experiments that analyzed external station surfaces and observed plasma waves, and installed an experiment called Icarus onto the Russian segment of the space station. 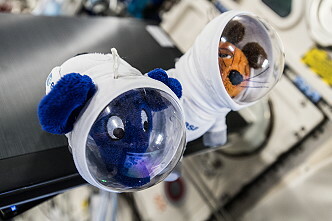 Icarus (International Cooperation for Animal Research Using Space) is a collaborative environmental experiment between the German Aerospace Center (DLR) and Roscosmos to study the migratory patterns of small animals on Earth. It consists of an antenna and GPS hardware to track the movements of animals that have been tagged with small GPS receivers. The experiment may provide data about how animals move from one location to another, how animal population density shifts over time, and how diseases spread. Filled with trash, the unpiloted Russian cargo ship Progress MS-08 undocked from the Zvezda service module of the International Space Station at 02:16 UTC on August 23, 2018. On August 30, 2018, Russian flight controllers will send commands to fire the Progress' engines and deorbit the space freighter, sending it to a destructive entry over the unpopulated South Pacific Ocean. Ground controllers detected the slight loss in air pressure around 23:00 UTC on August 29, 2018, but they did not wake the crew after determining the station was in no immediate danger. 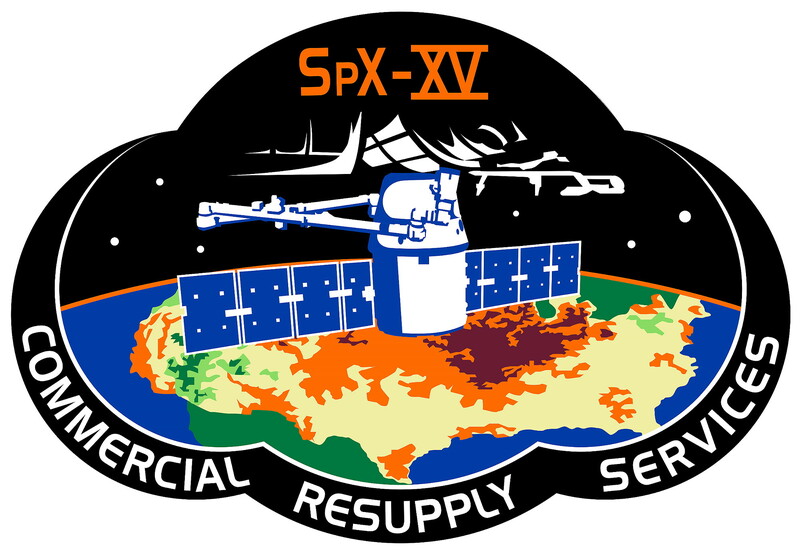 When the crew woke up at their normally-scheduled time on August 30, 2018, mission controllers directed them to search for the cause of the leak. After extensive checks, the station crew traced the leak to the orbital section of the Russian Soyuz MS-09 crew capsule, which ferried a Russian cosmonaut, a European astronaut and a NASA flight engineer to the orbiting complex in June 2018. 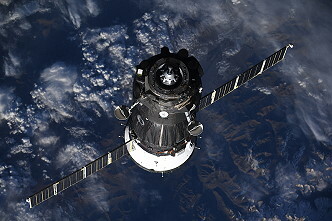 The orbital module, at the forward end of the Soyuz spacecraft, provides a habitation area for the crew during the trip to the station, and is jettisoned before re-entry to burn up on the atmosphere. 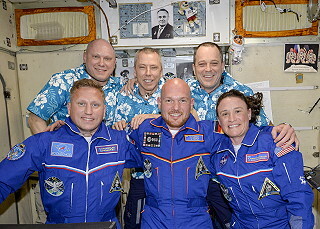 Station crews return to Earth inside a separate compartment of the Soyuz, the landing module. Working inside the Soyuz MS-09 spacecraft docked with the station's Earth-facing Rassvet module, cosmonauts Oleg Artemyev and Sergei Prokopyev sealed the 2-millimeter (0.08-inch) opening with a wipe saturated in an epoxy sealant, stemming what NASA described as a "minute pressure leak". Officials did not immediately say on August 30, 2018 what caused the air leak, but it could have been created by a collision with a fragment of space junk or a micrometeoroid, or some type of malfunction inside the Soyuz capsule. The cosmonauts covered the tiny hole with Kapton tape, then downlinked detailed endoscope imagery damage site to experts at Russia's mission control center in Korolev, near Moscow, who recommended the crew apply an epoxy over the opening to seal it. After some debate between NASA flight controllers, station commander Andrew Feustel, and Russian engineers on the best way to plug the hole, the cosmonauts were directed by managers in Russia to use a strip of cloth saturated in a sealant on both sides. Russian mission control instructed the crew to push the gauze into the hole, then tape the edges and let it settle and dry. 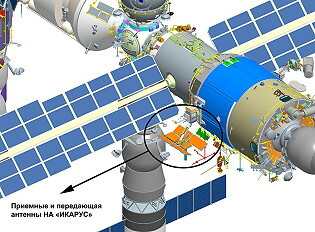 A few minutes after 17:00 UTC, the cosmonauts radioed down to Earth that the hole was plugged. The crew reported a bubble where they applied the sealant, but they detected no further signs of a pressure leak when listening for the rush of air with a sensitive microphone. 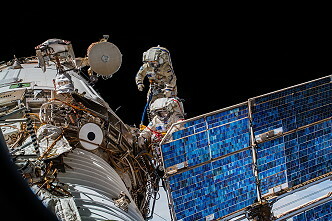 On September 06, 2018, an ISS reboost was performed using Service Modules Zvezda's thrusters. This reboost was to set up for Soyuz MS-08 landing on October 04, 2018 and Soyuz MS-10 launch planned on October 11, 2018. The engines started at 00:50 UTC and fired 13.1 seconds. The ISS got 0.2 m / sec. more speed. The actual parameters are 402.8 km x 426.0 km. The ISS needs 92.613 minutes for each orbit. 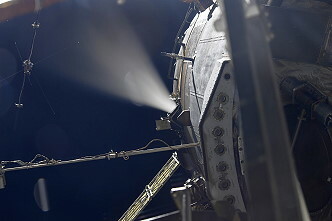 On September 20, 2018, an ISS reboost was performed using Service Modules Zvezda's thrusters. This reboost was to set up for Soyuz MS-08 landing on October 04, 2018 and Soyuz MS-10 launch planned on October 11, 2018. The engines started at 20:05:08 UTC and fired 17 seconds. 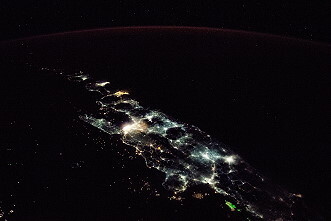 The ISS got 0.26 m / sec. more speed. The actual parameters are 403.35 km x 423.32 km. The ISS needs 92.69 minutes for each orbit. The Japan Aerospace Exploration Agency (JAXA) launched its H-II Transfer Vehicle (HTV)-7 at 17:52:27 UTC on September 22, 2018 from the Tanegashima Space Center in southern Japan. 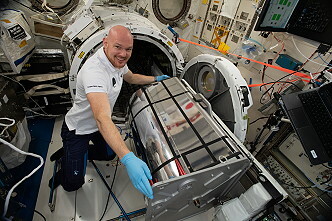 Named Kounotori, White Stork in Japanese, the unpiloted cargo spacecraft is loaded with six new lithium-ion batteries and adapter plates to replace aging nickel-hydrogen batteries that make up part of the station's electrical power system. 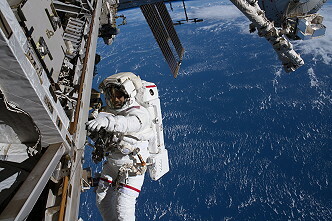 The batteries will be replaced through a series of robotic operations and two spacewalks planned for October 2018. Also aboard HTV-7 is a small reentry capsule designed by JAXA that will be assembled by the station crew prior to HTV-7's departure fall 2018. The cone-shaped capsule, measuring 2 feet (0.61 meter) high and 2.7 feet (0.82 meter) wide, is an experimental technology demonstration designed to test JAXA's ability to return small Japanese science payloads from the station for expedited delivery to researchers. Following HTV-7's departure from the station and several deorbit maneuvers, the capsule will be ejected from the spacecraft's hatch for a parachute-assisted splashdown off the coast of Japan, where a JAXA ship will recover it. 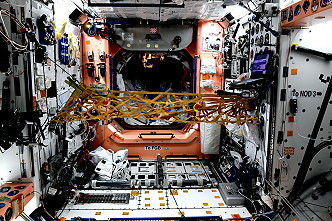 Additional experiments and equipment in HTV-7 include a new sample holder for the Electrostatic Levitation Furnace (JAXA-ELF), a protein crystal growth experiment at low temperatures (JAXA LT PCG), an investigation that looks at the effect of microgravity on bone marrow (MARROW), a Life Sciences Glovebox, and additional EXPRESS Racks. 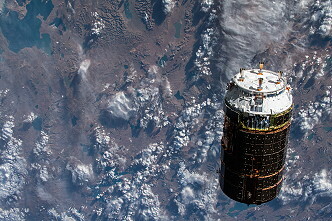 HTV-7 arrived at the space station on September 27, 2018. 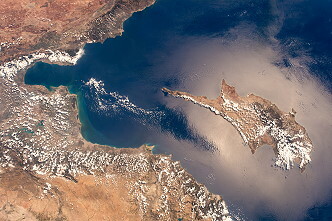 Expedition 56 Commander Andrew Feustel and Flight Engineer Serena Auñón-Chancellor operated the station's Canadarm2 robotic arm to capture the spacecraft as it approached from below. 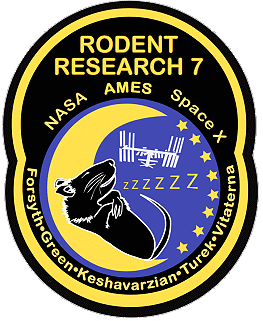 Flight Engineer Alexander Gerst monitored HTV-7 systems during its approach to the orbiting complex. 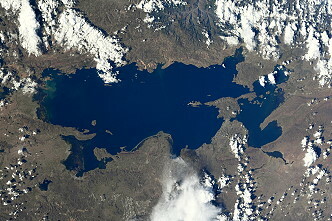 Capture was at 11:34 UTC. After a break the spacecraft installation to the space station's Harmony module by ground controllers operating Canadarm2 remotely followed (14:09 UTC). Finally the station command changed from US astronaut Andrew Feustel to German astronaut Alexander Gerst. 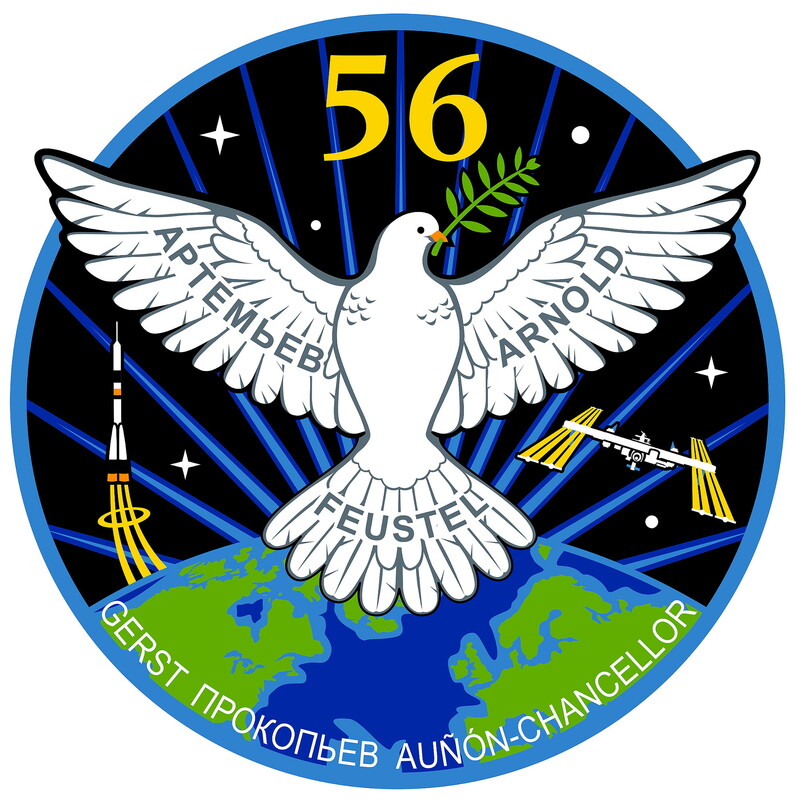 With undocking of Soyuz MS-08, carrying Oleg Artemyev, Andrew Feustel and Richard Arnold, on October 04, 2018 at 07:57:32 UTC the Expedition 56 concluded and the new ISS Expedition 57 began. Sextant Navigation tests use of a hand-held sextant for emergency navigation on missions in deep space as humans begin to travel farther from Earth. 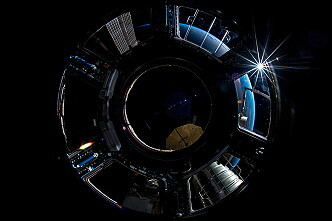 The ability to sight angles between celestial objects offers crews another option to find their way home if communications and main computers are compromised. 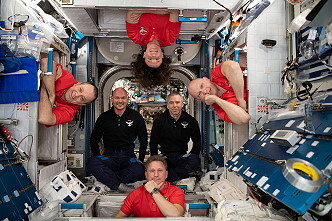 Biomolecule Extraction and Sequencing Technology (BEST) advances the use of sequencing processes to identify microbes aboard the space station that current methods cannot detect and to assess mutations in the microbial genome that may be due to spaceflight. The investigation sequences microbes directly from a sample with minimal preparation, rather than with the traditional technique that requires growing a culture from the sample. Insight from BEST could help protect humans during future space exploration and provide new ways to monitor the presence of microbes in remote locations on Earth. Over the years, some incredible science has come about by accident when scientists have tested things on themselves. You've got to know what you're doing, or be adult enough to take the risk, so don't go experimenting with dangerous stuff at home. Alexander Gerst and his team will know what they're doing when they conduct the myotones experiment. It will be the first experiment to monitor basic biomechanical properties of human skeletal muscles, using a non-invasive, portable device. They want to find out more about the effect of zero gravity on the muscular system. The Immuno-2 experiment will try to find out how the human immune system is affected, possibly weakened, by stress. It will combine biochemical and psychological factors, including stress from living and working in isolation, heavy workloads, and disrupted sleep patterns. Some experts say stress can cause debilitating mental illnesses - people get so sick they can't work. Immuno-2 may lead to new therapies. Failing self-experiments we humans have always preferred to put the lives of other animals at risk first. Fear not, however. No birds will be harmed with the ICARUS experiment. In fact, it may help humans understand animal migration a whole lot better. Birds will be fitted with small transmitters, weighing about five grams (0.18 ounces). Data from their migrations - including location, acceleration and environmental factors - will be sent to the ISS. This one's a bit complex, but it's another first for ISS research, and it can't be done on Earth. So here goes. It's all about understanding the smallest things in our universe - yes, we're talking quantum physics. First, scientists will generate clouds of rubidium and potassium atoms. Second, they will use laser light to slow down the movement of those atoms. The atoms then get trapped in an "atom chip" or magnetic field trap, and that's where the slowest and coldest atoms will remain. When their temperature drops close to absolute zero, they behave like a giant atom called a Bose-Einstein condensate (BEC). And that's what the scientists will want to examine macroscopically - to understand these atoms at a level of quantum physics, or quantum mechanics. Quantum mechanics has been described as the "rules of the game" that describe how atoms and single particles of light (photons) behave. 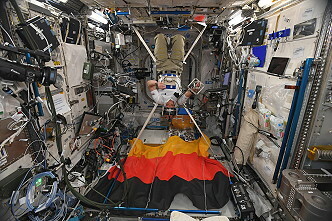 The experiment was started during Alexander Gerst's first ISS mission in 2014 (Expedition 40 / 41). During the Horizon's mission, MFX-2 will be equipped with advanced sensors and operated with various samples, including nickel-iron meteorites and chondrites, meteorites that have gone largely unaltered since the beginnings of our solar system. Last update on February 16, 2019.